For the most part, the baseball industry shuts down over Thanksgiving break, but everyone’s back now, and the Braves have signed Josh Donaldson, to say nothing of Brian McCann. The Mariners are reportedly trying to figure out a way to trade Robinson Cano. The Diamondbacks are reportedly more interested than ever in trading Paul Goldschmidt. Bryce Harper‘s on the market! Manny Machado’s on the market! Let’s spend a few minutes talking about DJ LeMahieu. As a veteran player, LeMahieu profiles as a fairly ordinary free agent. He’s a second baseman who turned 30 in July, and last year he posted a wRC+ of 86. The year before, he posted a wRC+ of 94. The Rockies declined to extend to LeMahieu a qualifying offer, which would’ve been worth $17.9 million, and MLB Trade Rumors thinks LeMahieu will eventually sign somewhere for $18 million over two years. Kiley McDaniel thinks he’ll sign somewhere for $22 million over two years, and the median FanGraphs crowd estimate put him at $36 million over three years. Pretty good money, all things considered, and LeMahieu is going to be a regular. But let me shine a brighter light on his skillset. I want to show you something that might well influence LeMahieu’s ceiling. LeMahieu is clearly one of the second-tier free agents, and one of the less-captivating free agents. No fan’s dream offseason scenario involves their team making DJ LeMahieu its biggest splash. He’s not a star player, and he’s spent most of his career in a lower-visibility market. LeMahieu’s best season happened back in 2016. That might as well have been a decade ago. Now, when you look closer, LeMahieu actually is a fairly remarkable player. Not only does he grade out as a quality defender — he’s been an extreme opposite-field hitter, in the mold of, say, Joe Mauer, or Derek Jeter. LeMahieu’s a righty who’s peppered right field, and many of you might recall Arizona’s LeMahieu shift. This is someone who’s let the ball travel. In an era that’s had an increasing number of players facing infield shifts, LeMahieu has been someone different. It feels good to see someone different. But, well — what if LeMahieu were to change? What if he were to try to be more like somebody else? Last year, we wrote countless articles about Eric Hosmer and Christian Yelich, articles that asked what might happen if they made an effort to lift the ball. LeMahieu, as a hitter, is similarly interesting. LeMahieu consistently hits the ball hard — and, just as important, LeMahieu consistently hits the ball when he swings. The following plot is pretty simple, showing 2018 data. 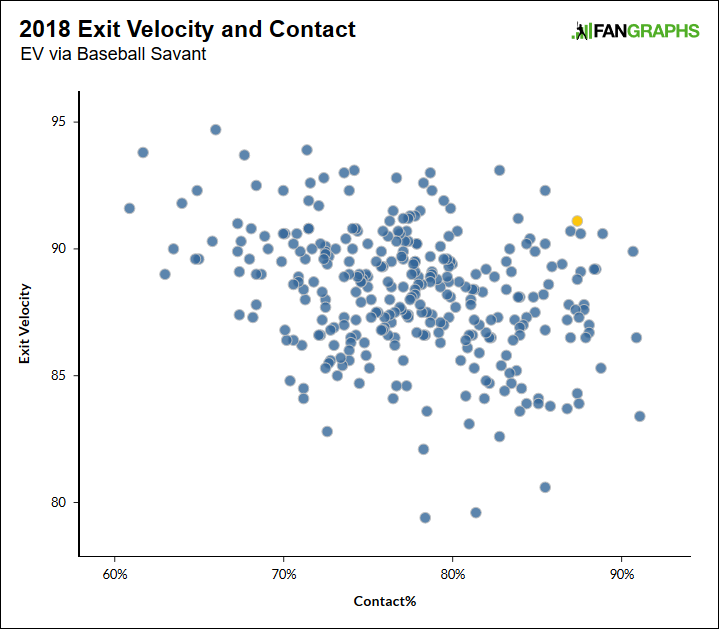 On one axis, you’ve got average exit velocity, from Baseball Savant. On the other axis, you’ve got contact rate. LeMahieu is the point highlighted in yellow. You see him off in the upper right. Last season, there were more than 300 players who batted at least 250 times. But there were just six players who were at least one standard deviation better than the mean in both exit velocity and contact. LeMahieu shows up as one of the six, along with Mike Trout, Mookie Betts, Anthony Rendon, Joe Mauer, and Nick Markakis. These are hitters we might describe as having excellent bat control. Not only do they hit the ball, but they hit the ball square. Bat control has been indicative in the past. We’ve seen a number of bat-control hitters start to turn on the power. Matt Carpenter’s is the first name to come to mind, but another comp would be Daniel Murphy. Murphy turned into a power hitter later in his career than usual. In Cleveland, both Francisco Lindor and Jose Ramirez have turned good batted balls into great ones. Justin Turner, of course, has followed a non-traditional path to stardom. It’s not so much that great bat control just leads to home runs. But there’s reason to believe the players with great bat control can learn to hit for more power without giving up too much other ground. LeMahieu doesn’t have to change, but you couldn’t blame a team for wondering. [Walt] Weiss has praised [LeMahieu’s] “surprising power,” but hitting coach Blake Doyle doesn’t expect home run power to play into his game much going forward. While LeMahieu claims he was not motivated by the alignments, he did say he has been trying to add more pull-side power to his game. Rockies assistant hitting instructor Jeff Salazar offered further insight on the development of LeMahieu. Salazar said LeMahieu is not consciously thinking about pulling the ball; rather, he’s made an adjustment to develop a more “linear” bat path, which has allowed him to advance his contact point, on occasion, further out in front of the plate. Just like Hosmer, and just like Yelich, LeMahieu doesn’t have to dramatically change anything. Over the past three years, he’s been a top-five defensive second baseman according to both DRS and UZR, and he projects to be an above-average player. LeMahieu can choose to remain what he is, just as Mauer did, and a team can choose to be happy with that. There’s nothing wrong with playing this version of the man. But when he’s in the box, LeMahieu’s standout skill is getting the right part of the bat to the baseball. Because of that, you can see how, in this day and age, a team might look at him as the potential next Daniel Murphy — a Daniel Murphy who plays far better defense. There are, of course, no guarantees, and LeMahieu would have to be willing to make some adjustments. But there’s even more talent in there than you’d think. Here is one candidate for the next power breakout. We hoped you liked reading The Hidden Upside of a Normal Free Agent by Jeff Sullivan! Sounds like a Dodger to me.